Quilting and Life in General: What a quilt-y week! We left on a very PACKED 30 seat bus last Sunday. And we thought we were traveling light! A good day for traveling and the bus had huge windows for us to enjoy the view. We stopped at Greenbaum's in Salem on the way. A favorite store to stop at. And still arrived at Menucha an hour early! 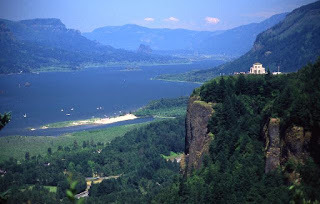 This is the view from the pool area - Vista House. One of my favorite places in Oregon - there is a plaque there that says something like, "We must find the most scenic places and get the people to them." Gotta love the Corps of Engineers - they had their work cut out for them in Oregon! If you ever get a chance to attend something at Menucha - do it! The staff was friendly, the food was good and the views were spectacular! And we got to sit and quilt, quilt, quilt with a room full of other quilters! Heaven, indeed! In 2 and 1/2 days I got 48 of 100 log cabin blocks done for A&J2's wedding quilt; sewed smaller checkerboard blocks into bigger checkerboard blocks for the 'cancer recovery quilt' and pieced a Christmas wreath wall quilt that had been languishing in it's box since Nebraska. Thanks P! It's awaiting quilting but is DEFINITELY going to be done by December. It's just the right size for the one place I hang quilts! A very productive retreat. Got home to an iery-ly quiet house - R was on a golf trip. The silence was just what I needed after sensory overload on retreat! Thursday I got up, went to water aerobics and then stitchery. Thanks to a group of women that I pushed around (:>) we got the 'cancer recovery quilt' top completed. After my "Fall Grand Tour" we'll tie it with prayers, bind it, take it's picture and present it to S. By the way - it looks wonderful! Thursday night was guild meeting and Friday was an all-day workshop! That's right - counting packing last Saturday - that's seven FULL days of quilting. Just the right amount! LOL! AND I quilted Mr M's new quilt today by machine! Nope, not tired of quilting yet!!! Tomorrow we leave for 8 days of exploring our favorite places in Oregon. More from the road later!